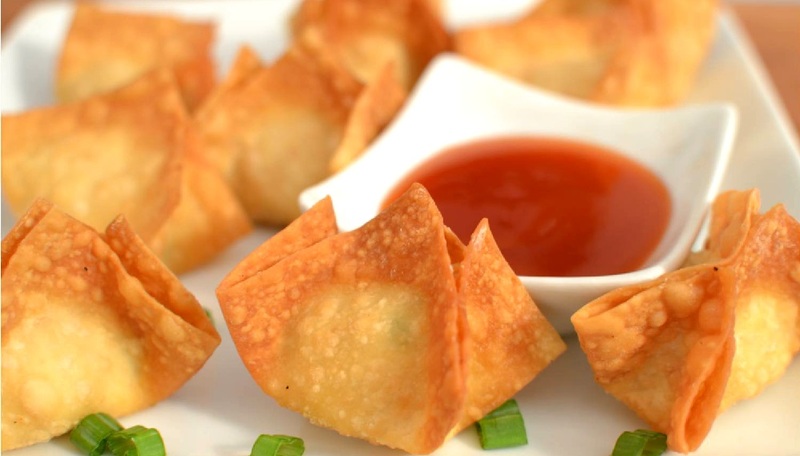 Crab Rangoon: Crab rangoon are deep-fried dumpling appetizers served in American Chinese and more recently, Thai restaurants, stuffed with a combination of cream cheese, lightly flaked crab meat, with scallions, and/or garlic. These fillings are then wrapped in Chinese wonton wrappers in a triangular or flower shape, then deep fried in vegetable oil. The filling for crab rangoon is ready. Place the wonton wrappers on a work surface. Spoon 1 1/2 teaspoons of the mixture into the centre of each wrapper. Using your finger, rub the edges of the wrappers with water. Join the centre of each edge/side of the wonton wrapper to create a flower shape. Heat the vegetable oil in a large skillet on medium heat. Working in batches, deep fry the flower shaped wonton wrappers until evenly golden brown and crispy, takes about 1-2 minutes. Drain and transfer to a paper towel-lined plate. Crab Rangoon is ready to be served. If you have any queries regarding the Crab Rangoon recipe, please leave a comment.